Home / NEWS / CAMPAIGNS / Strictly Elsa! Elsa Perez may not be a name you are familiar with, but to many, she is a truly inspirational woman. Born in South Africa, Elsa was forced to leave her homeland in 1961 due to the limitations her mixed ethnic heritage placed on her. Making her home in London, she has been active in her community ever since. 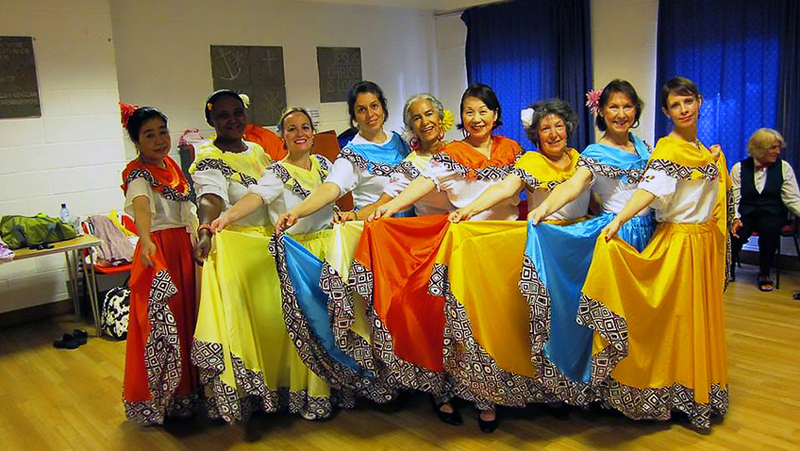 A passionate and accomplished dancer, choreographer and dance teacher, Elsa has been sharing her joy of dance with the young and young at heart for decades, and was a founding member of the London School of Samba. Now 83 years young, Elsa remains full of vitality and has an infectious, boundless enthusiasm. 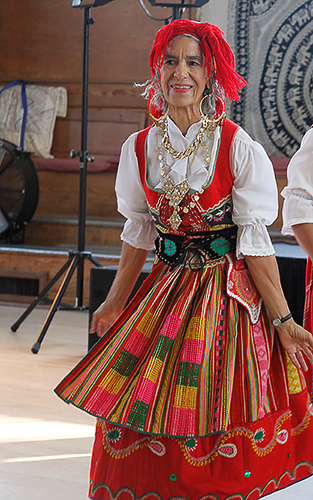 She still teaches dance and holds weekly classes at the Swiss Cottage Community Centre – for which she is unpaid – in the traditional dances of Portugal, Spain, Basque, Mallorca, Andalucia, Latin American (Mexican, Cuban, Brazilian, Colombian, Argentinian) and South Africa, and choreographs Riel to South African music. On top of that she manages to find time to dance with the London School of Samba and Mandinga Carnival Arts, makes all the dancers’ costumes, dance with four London dance groups, tend her allotment, do charity work and travel the country holding classes and talks. Just thinking about it is exhausting to most of us! Elsa has danced her way around the country, the world and into many people’s hearts and remains as passionate as ever about sharing her enthusiasm for dance, preserving the world’s cultural heritage and giving youngsters the opportunity to develop creatively. In recognition of her tremendous contribution to world dance, Elsa has been awarded the prestigious membership of the UNESCO Council of International Dance. In 2015 a group of teenagers from a township north of her native Cape Town in Northern Cape won an International Traditional Dance competition in Los Angeles against all the odds in 2015. It came as no surprise to find that Elsa wanted to do something to help. Elsa was determined to fund a 30-minute film called Elsa and the Riel Dancers. Enter Moira Rowan; a freelance producer, filmmaker and writer who specialises in making films that highlight community projects. Moira’s first film with Will Barnard, called ‘Get Riel – 82 years in the making’ has done very well at a number of film festivals and has won some awards (http://vimeo.com/221754984). ‘Get Riel – 82 years in the making’ was selected for: Africa Eye; New Black Collective; Scenecs Debut Film Festival, Holland; London Short Film Festival; Silver State Film Festival, Nevada; Pinnacle Film Festival USA, nominated for Best Documentary. The film has had a significant number of successes: 3rd at the Women over 50 Film Festival, Brighton; the Best Foreign Short, New York; and Best Documentary at the Austin Micro Short Film Festival, Texas. Moira’s current project is a short feature film Elsa and the Riel Dancers, ‘that will show Elsa teaching the children to Samba and the children teaching Elsa the riel, proving that intergenerational teaching is alive and well! Elsa has made the Samba costumes for the 21 boys and 9 girls who will dance the Samba choreography that she teaches. The young dancers will keep these costumes for this new dance in their repertoire’. 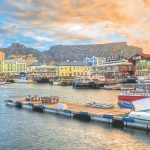 Once the film has been made, the plan is to sell it and put the funds raised into a trust fund to help support the youngsters’ continuing education and the costs of the increasing demands for their performances within South Africa and beyond. Schooling is still an issue for many in the poorer areas of Cape Town, where unemployment is high and where the everyday costs such as schoolbooks, fees and uniforms put education beyond the reach of many. Elsa has just returned from the UNESCO World Congress on Dance in Athens, where she performed a Riel dance, taught a workshop and enjoyed performances, workshops and lectures given by conferees from all over the world. By sharing her joy of dance and having a positive and altruistic attitude to all she does, Elsa proves that age really is just a number.